Keyper is a game for 2 to 4 players, played over four season. Each player starts the game with a team of 8 'keyples' (wooden workers) in 7 colours, each with a different skill, plus a 'keyper'. The aim is to create the best economy on their own player board, by developing their farm and village, exploiting shipping opportunities and holding fairs. 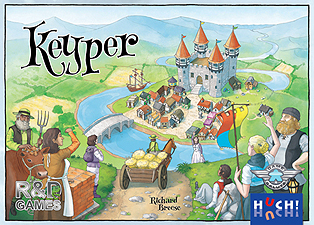 Keyper is different from most other board games. The folding country boards contain fields and shipping opportunities, on which keyples can work alone or together with other players' keyples, often on other player's turns, in order to gain actions and resources. A player's team of keyples will change in colour and number each season. If they are all utilised ahead of their opponents' keyples, then there may be lucrative opportunities for them to work for a second time. Keyper provides new gaming concepts and several different strategies to explore, with lots of player action and tactics throughout. The player whose farm, village and activities create the most points wins the game.